Bolder and brighter. 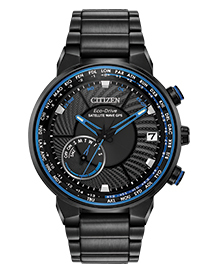 Enhanced technical and architectural design; the CITIZEN® Satellite Wave GPS Freedom is the leader of the pack with the world's fastest timekeeping signal reception speed from GPS navigation. 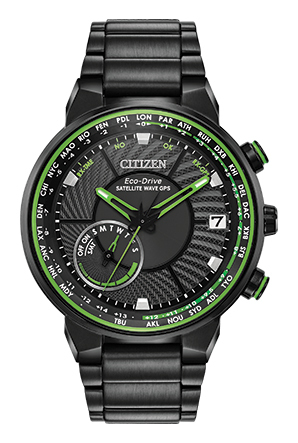 Shown in a sleek black ion plated stainless steel case and bracelet, black dial and brilliant green accents, it features satellite GPS timekeeping technology with worldwide reception and time adjustment in 40 time zones. Powered by Eco-Drive technology – powered by light, any light. Never needs a battery.